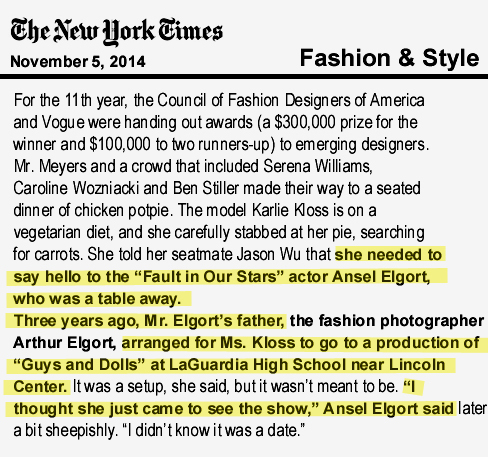 We had to stop and cut the article out (yes, some of us still read the newspaper on actual paper and not on our smartphones) because “Guys and Dolls” was our first musical at the school – which, if you do the math, means that our children are graduating this year. It’s not because we were seated next to a supermodel (we weren’t) but because we were seated next to the people we love – family and friends who shared in our excitement. Seated in front of us were alumni who were eager to tell us what a wonderful four years we had ahead of us. Behind us were new friends we had met at our first studio meeting. Words can’t do justice to the feeling that night of coming together as a community to celebrate the work of all our children – in all of the school’s studios. Since then it’s become an annual tradition for us among our family and friends. It seems fitting that this year’s musical is “In the Heights” because it’s about New York City kids chasing their dreams – which is just about the best description we can think of for LaGuardia. Please buy your tickets and share in this wonderful experience! Who will you be sitting next to? Enter the pre-sale code that was sent you you in email and select your seats! Speaking of special events, the Fall Choral Concert is definitely a must see – and you can see for yourself; just click here and here for clips from previous years. Riverside Church is in the city at 490 Riverside Drive. The ticket price is $15 at the door only. (The ticket price was incorrect on the Yellow Sheet.) We hope to see you there! School will be closed on Tuesday, November 11th in honor of Veterans Day. The next Academic Forum will be held on Wednesday, November 19th. We will meet in the Library at 6:30 pm for a presentation from librarian Susannah Tamarkin and a Q&A with Dr. Mark Stricklin. Please continue to support the academic departments. Our teachers have asked for materials for their classrooms on DonorsChoose – please click here and make a contribution if you can. Are you interested in becoming a Parent Volunteer? 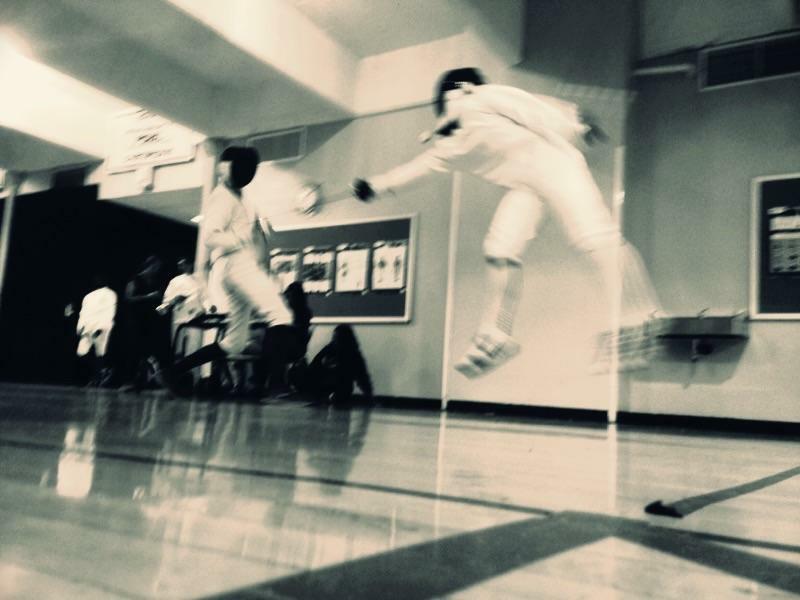 On Thursday, November 6, 2014, LaGuardia’s Boys Varsity Fencing Team, The Athletics, ended the regular PSAL season with a victory over Beacon High School: 86 v. 72! That makes this regular season’s Final Team Record 5-3. The amazing photo is of LaGuardia’s Anthony Leverett (on the right) flying through the air to make his point on his Beacon opponent, Littleton (on the left.) Bravo to Coach Falkove and the Athletics! 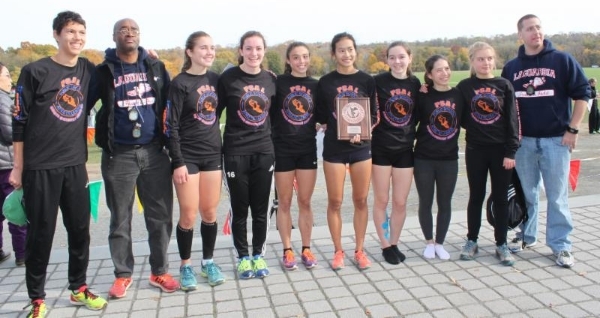 Congrats to Tomas Reimer and the LaGuardia Girls Track Team for qualifying to participate in the New York State Cross Country Championship! Tomas is the City Champ winning the the Boys Cross Country City Competition! Our Girls Team finished in 3rd place with Erika Yamizaki taking 3rd overall. Good luck to all at States next Saturday! Our Girls Bowling Team has made it to post-season play finishing first in their division!